Located in Old Town, ME and serving all of Maine including Augusta, Bangor, Lewiston, Portland, Auburn, Biddeford, and the surrounding areas. If your basement is properly insulated but you would like to remodel or refinish your basement in another way, we can help! 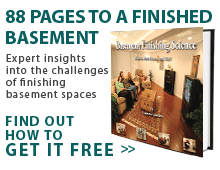 Our basement finishing contractors can turn even the dingiest basement into the most comfortable room in the house. Whether you would like to discuss installing new basement floors, walls, ceilings, windows, or lighting, our basement remodeling contractors are up to the task. Our Maine basement remodeling contractors proudly serve such towns as Portland, Lewiston, Bangor, West Scarborough, and Sanford. Whether you would like to pump up your basement's insulation, or transform your unused basement into a home theatre or spare bedroom, contact us today for your free basement remodeling inspection and quote! "It was perfect service and I wouldn't have changed a thing." It was perfect service and I wouldn't have changed a thing.